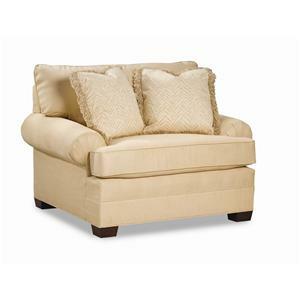 With a unique shape and inviting look, this conversation sofa is certain to fit your home’s décor. The curved shape of this curved sofa is perfect for facilitating conversation or fitting those hard to furnish spaces. 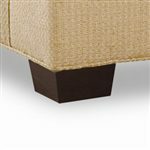 As fashionable as it is functional, this wedge sofa features low profile arms, exposed maple legs, and subtle welting throughout. Four nineteen-inch throw pillows, in your choice of coordinating or contrasting fabrics, complete the look. 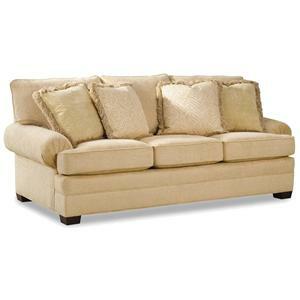 Add the finishing touches to your home with this distinctive and welcoming upholstered wedge sofa. This conversation sofa is 113" wide, 40" deep, and 39" tall. The 2061 Conversation Sofa with Curved Arms by Huntington House at Belfort Furniture in the Washington DC, Northern Virginia, Maryland and Fairfax VA area. Product availability may vary. Contact us for the most current availability on this product. 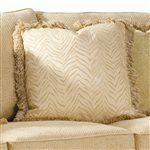 Pillow This upholstered sofa includes four nineteen inch throw pillows in your choice of coordinating or contrasting fabrics. 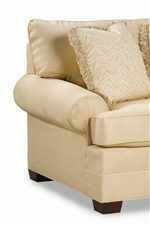 Browse other items in the 2061 collection from Belfort Furniture in the Washington DC, Northern Virginia, Maryland and Fairfax VA area.